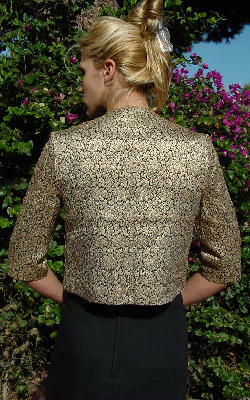 This vintage jacket has a black background with flowers and leaves on an antique white base with gold metallic thread. It has 3/4 length sleeves and a rounded neck. Wear it over a basic black shell or camisole, over a dress as your jacket, or even with a skirt that rides low. Your top should be shorter or to the length of this jacket. 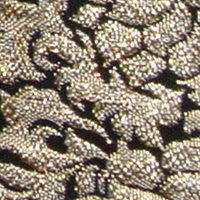 It's from a stylist's collection, and was used in a photo shoot with black and gold harem pants and the gold crackle-textured purse. armpit to armpit (jacket sides touching) 17 1/2"
The pattern does not display well in small pictures. Below is an accurate picture of the design.